It was the boy's birthday over the weekend, and as I'd already taken him to Nopi a couple of weeks earlier for a birthday treat (you could argue that it was only half a present - I was desperate to go and try it out myself!) I decided that I would cook him a nice meal on his actual birthday. This is the only course I will blog - the main was ethically unsound, and the dessert, while extremely delicious, was also extremely unphotogenic. This recipe comes via a proper chef - Luke Mackay - and was originally posted on his blog about 6 months or so ago. I know scallops are very Masterchef circa 2008; they are also extremely easy to cook which is vitally important when you're making a very complicated main course. More importantly, this was suitably special and interesting. The boy declared this better than the scallops we shared in Nopi. High praise indeed. I used pre-cooked lentils here as I'm lazy and wanted to remove the need for soaking, but if you use dried ones, make sure they are soaked and ready for use before you begin cooking. Remove the casing from the chorizo and finely chop into small cubes - about the same size as the lentils as a guide. Fry the chorizo until crisp, then add the lentils and the juice and zest of one lime. Add a pinch of salt and pepper and the pomegranate molasses and set aside until ready to serve. To cook the scallops, heat a pan with a little olive oil until very hot but not quite smoking, then sear the scallops for about 30 seconds on each side - just long enough to render the cooked surface slightly golden. 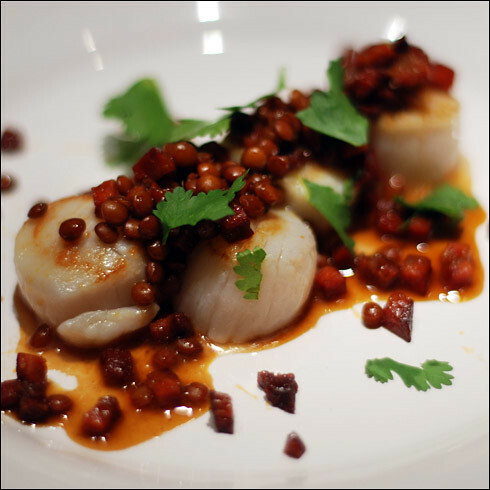 Place 4 scallops on each plate and then spoon the lentils and chorizo on top. Garnish with a few torn coriander leaves. I served this with a gorgeous Gaillac white wine - Galien, from the Domaine de la Chanade vineyard - which I'd brought back from France the previous Summer, which went with it beautifully. This combines just about all my favourite things in the world and is firmly bookmarked as a slightly decadent dinner for next week!